Introduction Ancient Peru was the seat of several prominent Andean civilizations, most notably that of the Incas whose empire was captured by the Spanish conquistadors in 1533. Peruvian independence was declared in 1821, and remaining Spanish forces defeated in 1824. After a dozen years of military rule, Peru returned to democratic leadership in 1980, but experienced economic problems and the growth of a violent insurgency. President Alberto FUJIMORI’s election in 1990 ushered in a decade that saw a dramatic turnaround in the economy and significant progress in curtailing guerrilla activity. Nevertheless, the president’s increasing reliance on authoritarian measures and an economic slump in the late 1990s generated mounting dissatisfaction with his regime, which led to his ouster in 2000. A caretaker government oversaw new elections in the spring of 2001, which ushered in Alejandro TOLEDO as the new head of government – Peru’s first democratically elected president of Native American ethnicity. The presidential election of 2006 saw the return of Alan GARCIA who, after a disappointing presidential term from 1985 to 1990, returned to the presidency with promises to improve social conditions and maintain fiscal responsibility. History The earliest evidence of human presence in Peruvian territory has been dated to approximately 11,000 years BCE. The oldest known complex society in Peru, the Norte Chico civilization, flourished along the coast of the Pacific Ocean between 3000 and 1800 BCE. These early developments were followed by archaeological cultures such as Chavin, Paracas, Mochica, Nazca, Wari, and Chimu. In the 15th century, the Incas emerged as a powerful state which, in the span of a century, formed the largest empire in pre-Columbian America. Andean societies were based on agriculture, using techniques such as irrigation and terracing; camelid husbandry and fishing were also important. Organization relied on reciprocity and redistribution because these societies had no notion of market or money. In 1532, a group of conquistadors led by Francisco Pizarro defeated Inca Emperor Atahualpa and imposed Spanish rule. Ten years later, the Spanish Crown established the Viceroyalty of Peru, which included most of its South American colonies. Viceroy Francisco de Toledo reorganized the country in the 1570s with silver mining as its main economic activity and Indian forced labor as its primary workforce. Peruvian bullion provided revenue for the Spanish Crown and fueled a complex trade network that extended as far as Europe and the Philippines. However, by the 18th century, declining silver production and economic diversification greatly diminished royal income. In response, the Crown enacted the Bourbon Reforms, a series of edicts that increased taxes and partitioned the Viceroyalty of Peru. The new laws provoked Túpac Amaru II’s rebellion and other revolts, all of which were defeated. In the early 19th century, while most of South America was swept by wars of independence, Peru remained a royalist stronghold. As the elite hesitated between emancipation and loyalty to the Spanish Monarchy, independence was achieved only after the military campaigns of José de San Martín and Simón Bolívar. During the early years of the Republic, endemic struggles for power between military leaders caused political instability. National identity was forged during this period, as Bolivarian projects for a Latin American Confederation foundered and a union with Bolivia proved ephemeral. Between the 1840s and 1860s, Peru enjoyed a period of stability under the presidency of Ramón Castilla due to increased state revenues from guano exports. However, by the 1870s, these resources had been squandered, the country was heavily indebted, and political in-fighting was again on the rise. Peru was defeated by Chile in the 1879–1883 War of the Pacific, losing the provinces of Arica and Tarapacá in the treaties of Ancón and Lima. Internal struggles after the war were followed by a period of stability under the Civilista Party, which lasted until the onset of the authoritarian regime of Augusto B. Leguía. The Great Depression caused the downfall of Leguía, renewed political turmoil, and the emergence of the American Popular Revolutionary Alliance (APRA). The rivalry between this organization and a coalition of the elite and the military defined Peruvian politics for the following three decades. In 1968, the Armed Forces, led by General Juan Velasco Alvarado, staged a coup against president Fernando Belaunde. The new regime undertook radical reforms aimed at fostering development but failed to gain widespread support. In 1975, Velasco was forcefully replaced as president by General Francisco Morales Bermúdez, who paralyzed reforms and oversaw the reestablishment of democracy. During the 1980s, Peru faced a considerable external debt, ever-growing inflation, a surge in drug trafficking, and massive political violence. Under the presidency of Alberto Fujimori (1990–2000), the country started to recover; however, accusations of authoritarianism, corruption, and human rights violations forced his resignation after the controversial 2000 elections. Since the end of the Fujimori regime, Peru has tried to fight corruption while sustaining economic growth; as of 2008 the president is Alan García. Politics Peru is a presidential representative democratic republic with a multi-party system. Under the current constitution, the President is the head of state and government; he or she is elected for five years and may not immediately be re-elected. The President designates the Prime Minister and, with his advice, the rest of the Council of Ministers. There is a unicameral Congress with 120 members elected for a five-year term. Bills may be proposed by either the executive or the legislative branch; they become law after being passed by Congress and promulgated by the President. The judiciary is nominally independent, though political intervention into judicial matters has been common throughout history and arguably continues today. The Peruvian government is directly elected, and voting is compulsory for all citizens aged 18 to 70. General elections held in 2006 ended in a second round victory for presidential candidate Alan García of the Peruvian Aprista Party (52.6% of valid votes) over Ollanta Humala of Union for Peru (47.4%). Congress is currently composed of the Peruvian Aprista Party (36 seats), Peruvian Nationalist Party (23 seats), Union for Peru (19 seats), National Unity (15 seats), the Fujimorista Alliance for the Future (13 seats), the Parliamentary Alliance (9 seats) and the Democratic Special Parliamentary Group (5 seats). Peruvian foreign relations have been dominated by border conflicts with neighboring countries, most of which were settled during the 20th century. There is still an ongoing dispute with Chile over maritime limits in the Pacific Ocean. Peru is an active member of several regional blocs and one of the founders of the Andean Community of Nations. It is also a participant in international organizations such as the Organization of American States and the United Nations. The Peruvian military is composed of an army, a navy and an air force; its primary mission is to safeguard the independence, sovereignty and territorial integrity of the country. The armed forces are subordinate to the Ministry of Defense and to the President as Commander-in-Chief. Conscription was abolished in 1999 and replaced by voluntary military service. A Canadian man was reportedly killed in the Peruvian Amazon after indigenous community members blamed him for the death of a spiritual leader. According to Peruvian prosecutors, the body of Sebastian Woodroffe, 41, was found by police after a video of his lynching surfaced on social media Friday, Reuters reports. Video footage reportedly shows a man in a puddle before another man wraps a rope around his neck and dragged him as onlookers watched. Woodroffe’s body was found 0.6 miles away from the home of Olivia Arévalo, the spiritual leader of the Shipibo-Conibo tribe and an indigenous rights activist. The 81-year-old died Thursday after being shot twice, and some members of the outraged community blamed her apparent murder on Woodroffe, who was believed to have been one of her clients. Canada’s foreign affairs department offered its “deepest condolences following the reported assassination of Olivia Arévalo Lomas, an indigenous elder and human rights defender,” Reuters reports. Arévalo’s death follows a slew of unresolved murders of indigenous activists who were threatened for opposing illegal loggers and palm oil growers, according to Reuters. There is little oversight in the Peruvian Amazon where local communities often punish suspected criminals according to local customs without official state involvement. “We will not rest until both murders, of the indigenous woman as well as the Canadian man, are solved,” Ricardo Palma Jimenez, the head prosecutor in Ucayali, told Reuters. 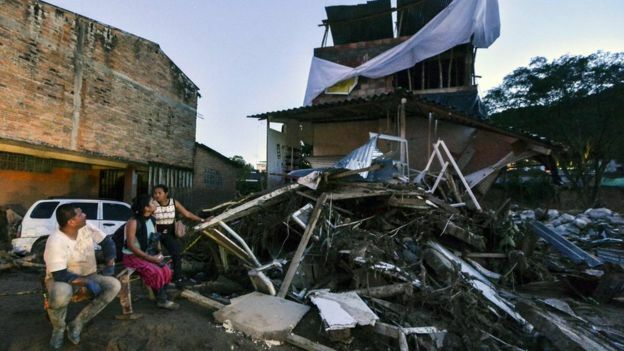 (CNN) Two people were killed when a 7.1-magnitude earthquake shook Peru on Sunday, according to a regional governor. One of the two victims was a 55-year-old man crushed by a rock in Yauca, tweeted Yamila Osorio, governor of the Arequipa region in southern Peru. The other victim died in the same region, Hernando Tavera, president of the Geophysics Institute of Peru, told TV Peru, without providing further details. 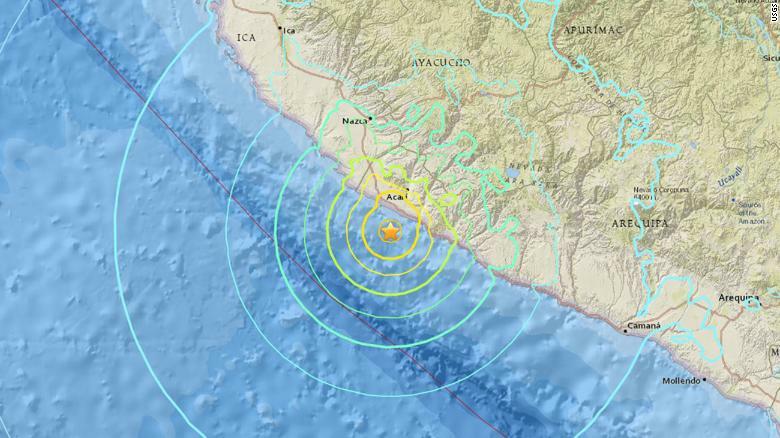 The 7.1-magnitude earthquake struck off the coast of southern Peru. At least 65 people have been injured in the cities of Arequipa, Ica and Ayacucho, also in southern Peru, the National Civil Defense Institute reported. The earthquake was centered near the coast of Peru, about 25 miles (40 kilometers) south-southwest of Acari, according to the US Geological Survey. Acari is about an eight-hour drive down the coast from Lima, the capital. The quake produced no tsunami threat, the USGS said. CNN Español’s Abel Alvarado contributed to this report. Rescue personnel work at the site of a bus accident north of Lima, capital of Peru, on Tuesday. 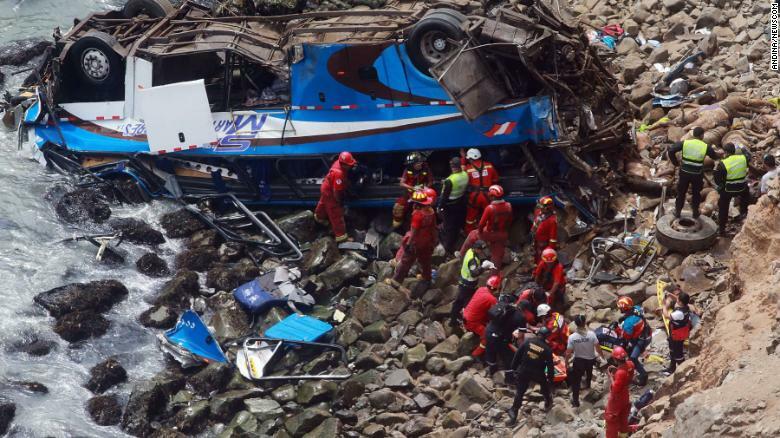 (CNN) At least 48 people were killed Tuesday when a bus went over a cliff north of Lima, said Lewis Mejia, a top Peruvian fire official. The Ministry of the Interior said the bodies were found in the bus, the Pacific Ocean and on the rocky beach. Six people were hospitalized with injuries. The accident occurred when a tractor-trailer collided with the bus, Peru transport chief Dino Escudero told state television agency Andina. 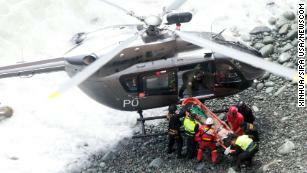 Rescue personnel transfer an injured person to a helicopter after the accident. The back of the bus was hit by the truck, which caused the bus to fall off a cliff, Escudero said. The preliminary investigation indicated that GPS showed both vehicles were going too fast, a tweet from the Ministry of Transportation and Communications said. More than 100 firefighters were involved in rescue efforts at the crash scene, a fire official told Andina. The crash occurred on the coastal road of Serpentin Pasamayo, Andina reported. (CNN) Hundreds of angry Peruvians packed streets for a second night to protest the release of ailing former President Alberto Fujimori from prison. Chanting “traitor” and “the pardon has got to go,” opponents of Fujimori continued their demonstration outside the Lima clinic where the former leader is currently being treated. Until his release Sunday, Fujimori was serving a 25-year prison sentence for human rights abuses. The son of Japanese immigrants, he served as Peru’s leader from 1990 to 2000. 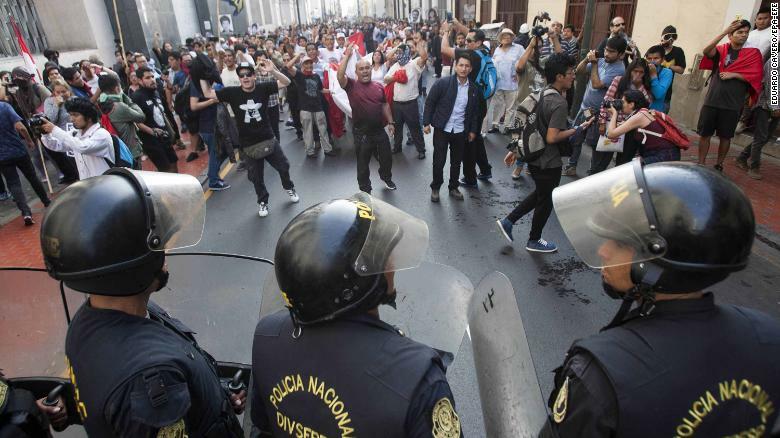 Police and protesters face off during a rally against the pardoning of Alberto Fujimori on Monday. Protesters clashed with police Monday as authorities attempted to quell the demonstration with tear gas canisters thrown at the crowd. 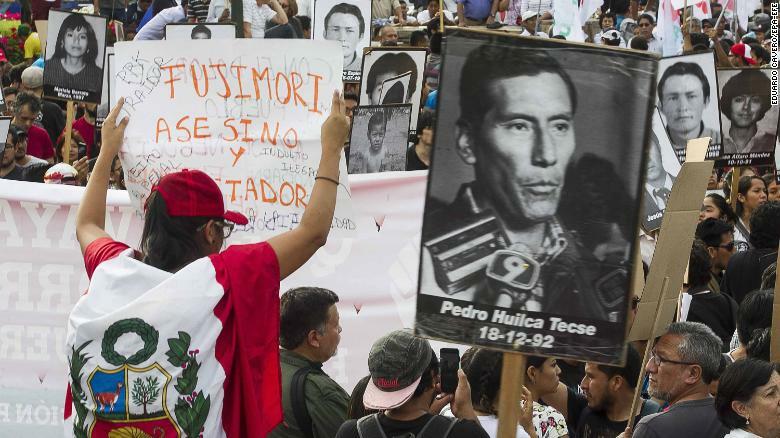 The jailed former leader was granted a pardon on Christmas Eve by current President Pedro Pablo Kucyznski, who citied Fujimori’s failing health as the reason for clemency. Fujimori is a divisive figure in Peru — credited with both stabilizing the country’s economic crisis and brutally repressing his opponents. In addition to the two days of street protests, the move was met with condemnation from some lawmakers, who questioned whether there was a political deal behind what Kucyznski’s office described as a humanitarian gesture. Three congressmen from Kuczynski’s party announced their intention to resign following the announcement of the pardon. Congressmen Vicente Zeballos and Alberto de Belaunde made similar announcements via social media on Sunday. 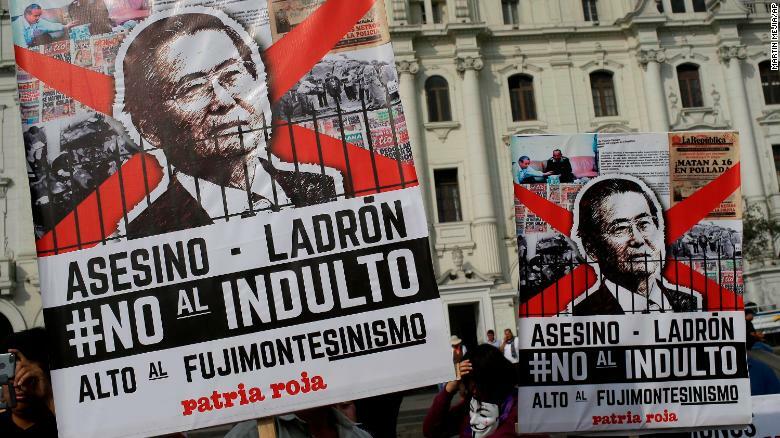 Demonstrators march in Lima on Monday to protest the presidential pardon for Fujimori. Kuczynski’s pardon of Fujimori comes less than a week after the current president survived an impeachment hearing stemming from a corruption scandal that has swept Latin America. Fujimori’s son, Kenji Fujimori, was among several lawmakers who abstained from last week’s vote to remove Kuczynski from office. Kuczynski survived, in part, because a total of 10 lawmakers from Kenji Fujimori’s party abstained, breaking ranks with their own leadership. Members of the party, Popular Force, are known as “Fujimoristas” because of their support of the former president. Local media reports chronicled how the split vote caused friction within the group, including one party spokesman who alleged that those who abstained did so as part as a pact with Kuczynski to pardon Alberto Fujimori. Fujimori is credited with defeating the Shining Path terrorists who destabilized the country, and his austere economic policies reined in hyperinflation. But the former president had an authoritarian streak and used security forces to repress opponents. In 2009, a special supreme court tribunal sentenced the former president to 25 years in prison for authorizing the operation of a death squad responsible for killing civilians. Jose Miguel Vivanco, executive director for the Americas Division of Human Rights Watch, denounced the pardon and also alluded to a pact. “Instead of reaffirming that in a state with rule of law there is no room for special treatment for anyone, the thought that will persist forever is that his freedom was a crude political negotiation in exchange for (Kuczynski) to remain in power,” Vivanco tweeted. CNN’s Mariano Castillo, Silva Fernandez, Kelly McCleary, Rafael Romo, Clara Lopez and Jimena de La Quintana contributed to this report. Peruvian Finance Minister Alfredo Thorne said on Monday that he would immediately resign if the opposition-controlled Congress disapproves of him in a vote of confidence that he had formally requested. Opposition lawmakers from across the political spectrum have called on Thorne, one of President Pedro Pablo Kuczynski’s closest Cabinet members, to step down after, in a leaked audio recording, he appeared to ask the comptroller to approve a controversial contract in exchange for a bigger budget. 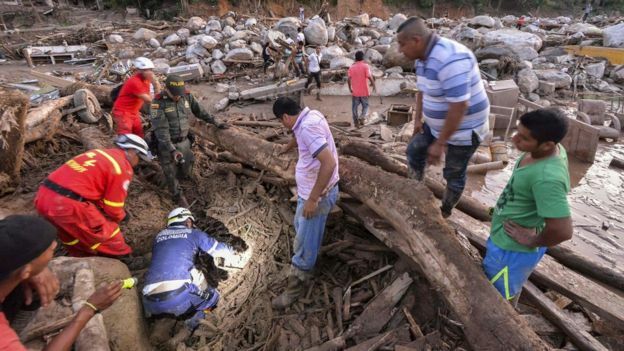 Rescuers are digging through mud and debris in the hunt for those missing after devastating mudslides in Colombia left more than 200 dead. About 1,100 soldiers and police are involved in the relief effort. 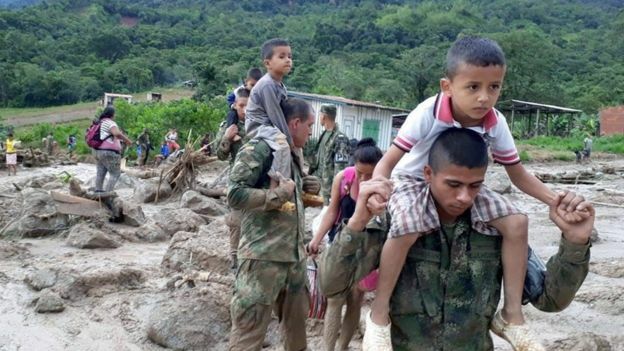 Heavy rain flooded the city of Mocoa in the country’s south-west with mud and rocks burying whole neighbourhoods and forcing residents to flee their homes. 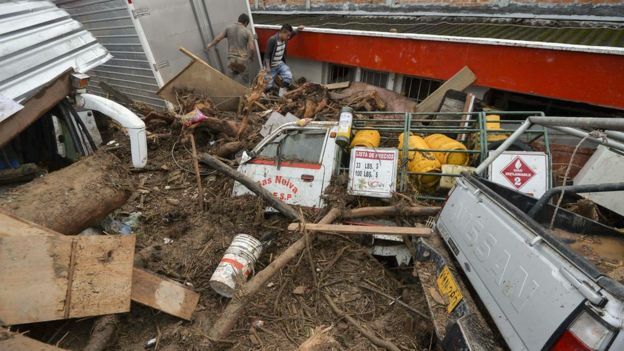 An army statement said there were at least 400 injured and 200 still missing in the capital of Putumayo province. The exact death toll is hard to confirm with the rescue operation is still under way. 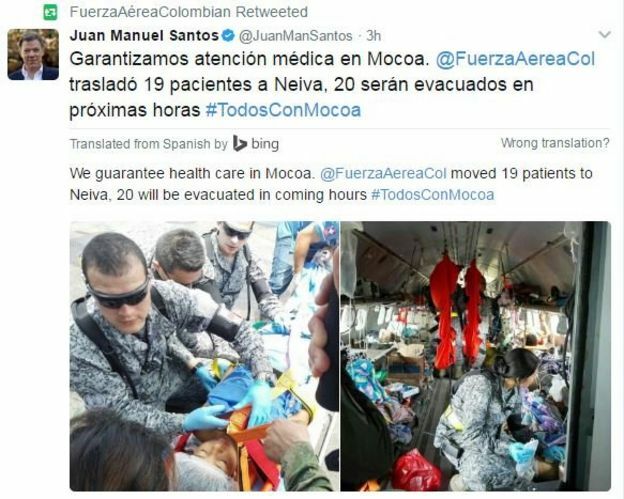 Some local media estimate up to 300 people have been killed, while the Colombian Red Cross has a total hovering above 200. The Red Cross said it was working to help family members contact each other. Video footage from the city showed residents crying over a list of missing children, along with their ages, pinned to a family welfare centre. President Juan Manuel Santos declared a state of emergency in the region and flew in to oversee the rescue effort. A senior UN official in Colombia, Martin Santiago, blamed climate change, saying it had caused “tremendous results in terms of intensity, frequency and magnitude of these natural effects” in the region. Others said deforestation has also played a role. “When the basins are deforested, they break down. It is as if we remove the protection for avoiding landslides,” said Adriana Soto, a Colombian conservationist and former environment minister. The Colombian Air Force is bringing supplies to the area as the search operation continues. With no running water in Mocoa, one resident told El Tiempo newspaper that they had been collecting rainwater. Power lines are also out across the area. Photos posted to social media by the air force showed some patients being evacuated by air. “Our heroes will remain in the tragedy zone until the emergency is over,” the army’s statement said. Colombia’s director of the National Disaster Risk Management Unit told the AFP news agency that a third of the region’s expected monthly rain fell during one night. Although rainfall is abundant in the area, this downpour was unusually heavy and caused rivers to burst their banks. The overflow then picked up mud and debris, creating a cascade. Video footage of the aftermath showed currents so strong that abandoned lorries were propelled through the flooded streets. Local resident Mario Usale, 42, told Reuters he was searching for his father-in-law. “My mother-in-law was also missing, but we found her alive 2km (1.25 miles) away. She has head injuries, but she was conscious,” he said. Landslides have struck the region several times in recent months. 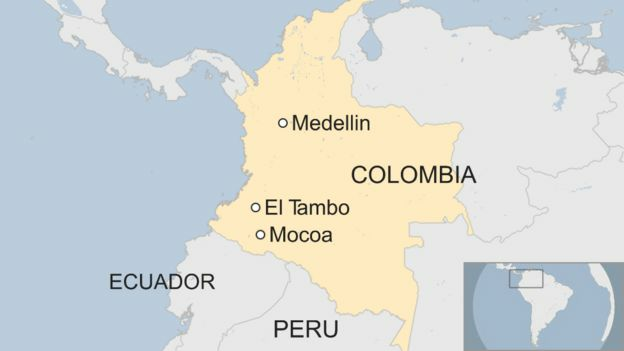 In November, nine people died in the town of El Tambo, about 140km (90 miles) from Mocoa, during a landslide that followed heavy rain. Less than a month before that, another landslide killed several people near Medellin, almost 500km (300 miles) to the north. And in neighbouring Peru, more than 90 people have died since the start of the year because of unusually heavy rainfall, which also caused landslides and flash floods. After their ancestors journeyed across an ocean from the edge of the Sahara to the center of the Amazon, their current numbers have dwindled in the wake of grim economic prospects and geographic isolation. Yet the pulse keeps beating for the Jewish community of Iquitos, Peru. 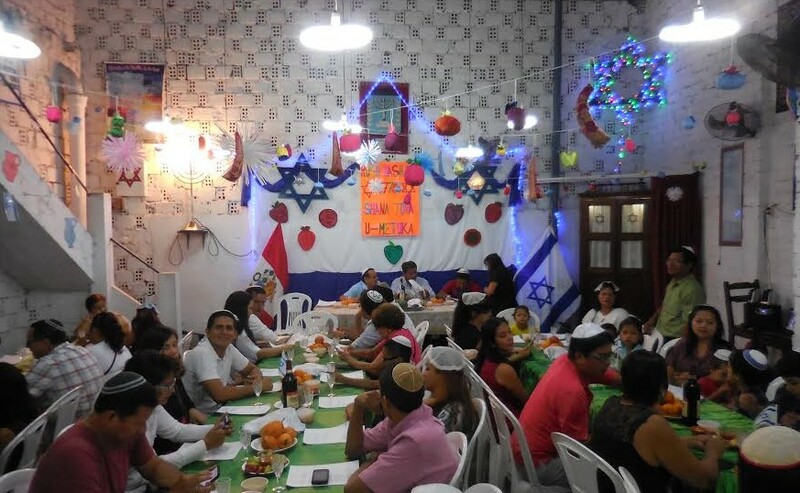 “We as a community in Iquitos are trying to create a Jewish life, which is not easy, because the conditions for it do not exist,” said community leader Rebecca Abramovitz in an interview in Spanish. Located in Loreto, Peru’s northernmost region, Iquitos is the largest city in the world unreachable by road. Visitors must either fly in or arrive by boat along the Amazon River. The Iquitos community does not have a rabbi, and meets for worship in the Abramovitz house. Its members represent a fraction of the hundreds of people who once practiced Judaism by the banks of the Amazon. Yet if their numbers are small, their story is compelling. They are the descendants of entrepreneurs who left Morocco for the promise of riches in the Amazon rubber boom in the late 19th century. Their Judaism has been revived by visits from rabbis elsewhere in Peru, as well as Argentina, the United States and Israel. Some have even undertaken another journey, to Israel, where they have made aliyah or are striving to do so. Earlier this year, a media report had forecast a bleak future for the community. But those members who stay in Iquitos continue to practice Judaism together, and regularly convene for events such as High Holiday services. In so doing, they preserve their ties with their ancestors who arrived in the Peruvian Amazon almost 150 years ago. The first Jew to immigrate to Loreto was Alfredo Coblentz, a German Jew who arrived in the city of Yurimaguas, southwest of Iquitos, in 1880. In 1885, the first year of the Amazon rubber boom, the Pinto brothers — Moses, Abraham and Jaime — immigrated to Iquitos itself. While they only lived there for five years, “they opened the road for the arrival of new immigrants,” Abramovitz said. The rubber boom caused a mass migration of people representing different countries and religions. “It brought businessmen and rubber workers from distinct regions of the world [to Iquitos], and among them, Jews from Morocco came,” said Rabbi Ruben Saferstein of Buenos Aires, who has been assisting the Jews of Iquitos for 15 years. It was not an easy journey. Jews from Rabat, Tetuan, Tangier and Casablanca arrived in the Brazilian coastal city of Belen do Para and trekked along the Amazon — the second-longest river in the world, after the Nile — further inland to Manaus. 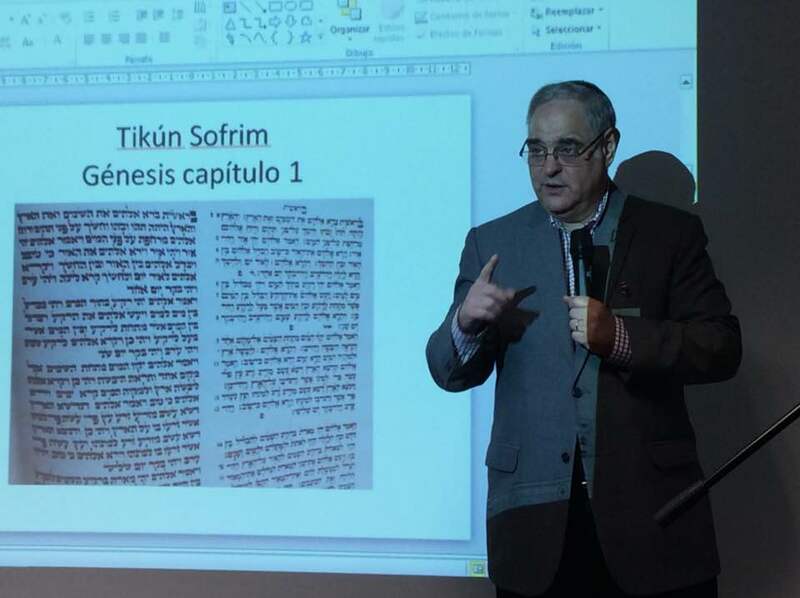 “There was a tremendous amount of money to be made there, in the rubber industry in the Amazon, in Peru and Brazil,” said Rabbi Andrew Sacks, Jerusalem-based director of the Rabbinical Assembly in Israel for the Masorti Movement, who visited Iquitos last Pesach. Luxurious mansions soon lined the streets of Iquitos, including the Casa Fierro (Iron House) designed by Gustave Eiffel, whose namesake tower in Paris earned architectural immortality. The Casa Fierro remains an Iquitos landmark. But the rubber boom also had adverse effects. One Iquitos-based company with a British board of directors, the Peruvian Amazon Company (PAC), was the subject of critical reports by Roger Casement, the British consul in Peru. Casement found that the PAC abused its indigenous workers. After public outcry, the company closed in 1913. The Amazon rubber boom itself had collapsed by 1912, owing to several factors, including a drop in the price of rubber; the emergence of larger zones of production, such as Indonesia; and the arrival of synthetic rubber. Many Jews in Iquitos returned to their countries of origin — but not all. By January 1909, enough Jews had begun residing in Iquitos to establish a formal community, the Sociedad Beneficencia Israelita de Iquitos. 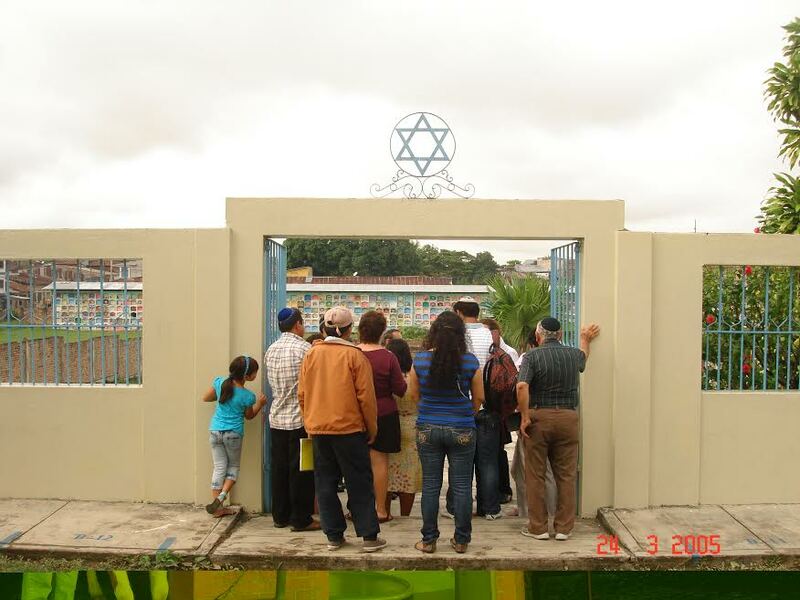 In Iquitos, Jews achieved success in both business and public life. Several became mayors of the city, including Victor Israel (who was also the first community president) and Joseph Dreyfus. Some founded businesses — La Casa Israel, Khan, and Cohen, along with Solomon Joseph and E. Strasberger. The Jews who stayed after the boom were in an uncertain position. The rubber industry that fueled their commerce with Europe had vanished, and their legacy as Jews was in question. Each year, she said, the Jews of the region celebrated Rosh Hashanah and Yom Kippur with religious services. Abramovitz said that emigration to the capital of Lima was “massive” in the 1950s, and by the 1960s, centers of Jewish life in almost every Peruvian province had disappeared. “Our community stayed dormant for many years,” she recalled. It was not until the 1980s that the community of Iquitos was able to reawaken. When several community members traveled to Lima, Peru’s capital, for medical treatments in 1987, they made contact with Rabbi Guillermo Bronstein, chief rabbi of the Asociacion Judia. Lima has the largest population of Peruvian Jews (3,000), and with about 223 families, Bronstein’s synagogue is the largest in the capital. In a Skype conversation from Lima, Bronstein told The Times of Israel he felt “curiosity” and that he exchanged letters with the community of Iquitos before deciding to visit in 1991. Then, Bronstein found a community of people who wished to identify as Jews but were not recognized as Jews. When Bronstein made his first visit to Iquitos, he laid the groundwork for the community to formally confirm its Judaism — individually and collectively. 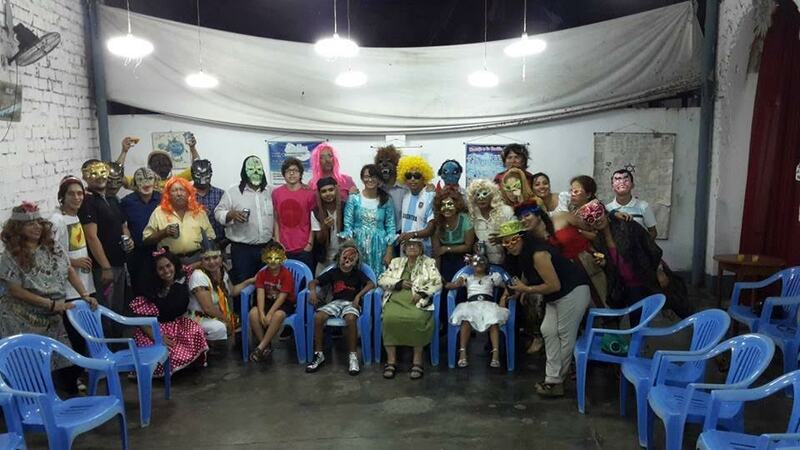 Members organized themselves as a kehila, a Jewish community of partners recognized by the Republic of Peru. They achieved this status about a year and a half later, in 1994. Bronstein then helped the kehila prepare for a formal conversion by a beit din, or rabbinical court. This process took much longer. These were not the only challenges. By August 2002, Bronstein had found a qualified mohel willing to travel to Iquitos. A beit din followed, assisted by Rabbi Claudio Kupchik of Temple Beth El of Manhattan Beach. “If we had not had the help of Rabbi Guillermo Bronstein, the community of Iquitos would not still exist,” Abramovitz said. About a century after Jews had first arrived in Iquitos, the kehila and its members were formally recognized. Over the next few years, the congregation benefited from outreach by rabbis from other countries. 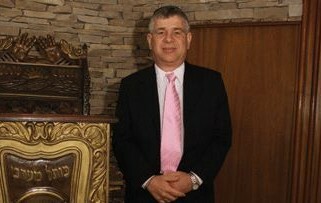 In December 2004, Bronstein presided over a second beit din with his brother Marcelo, who serves as a rabbi in New York, as well as Saferstein, of Buenos Aires. Over three days, they evaluated around 180 candidates from Iquitos and neighboring regions. 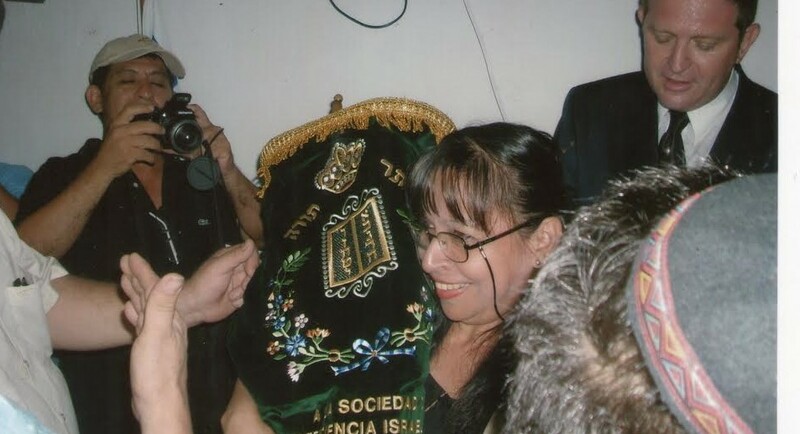 In February 2009, the kehila received a Torah scroll over 100 years old from Rabbi Fabian Zaidemberg of La Asociacion Israelita de las Pampas in Argentina. David and Nilma Igdaloff, an American Jewish couple, had donated the Torah to Zaidemberg after it had been rescued from Nazi Germany. A third beit din was held in 2011. 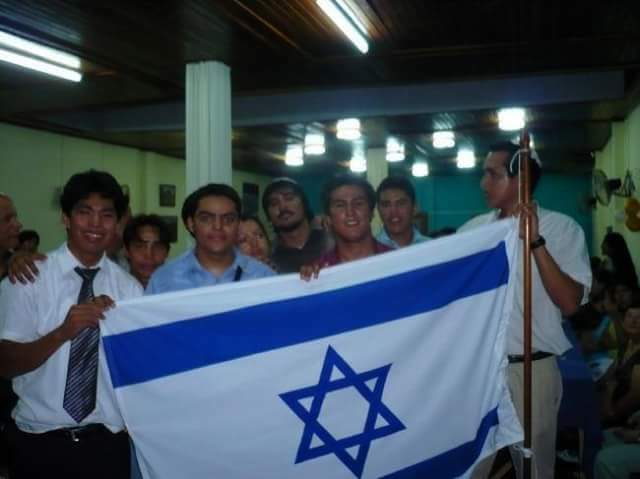 And, as the Jews of Iquitos continue to rediscover and reconnect with their roots, there is an increasing interest in making aliyah. The story of the Amazonian aliyah is an unfolding one and includes community members now living in Israel as citizens, members who would like to make aliyah, and individuals in Israel who are not currently recognized as Israeli citizens. The Interior Ministry has recognized Iquitos as a Jewish community and its members as eligible for aliyah, but it took a “long battle,” said Sacks, the director of the Rabbinical Assembly in Israel. The majority of olim from Iquitos live in Ramla. However, Sacks is unhappy with the Interior Ministry and its treatment of Jews from Iquitos who wish to join their fellow Iquitenos in Israel. The Legal Aid Center for Olim, a project of the Israel Reform Movement, has petitioned the Supreme Court to hear a case involving two sisters from Pucallpa who converted to Judaism in Iquitos in 2011. They have been in Israel since February 2014. The Interior Ministry “has argued that the community in Pucallpa was not a ‘recognized’ community at the time of the conversion and therefore although the conversion itself was performed in Iquitos, they refuse to recognize them,” Maor said. The Supreme Court is scheduled to hear the petition in January 2017. Saferstein expressed hope for another beit din to visit Iquitos in January 2017, but said that economic assistance is needed for this. 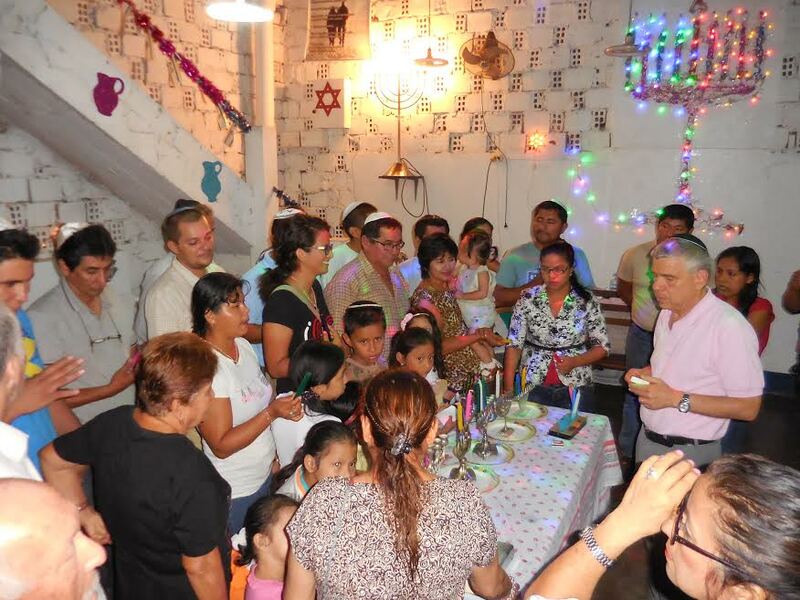 Despite gloomy predictions for the future of Iquitos’s Jews due to their shrinking population, Bronstein, who led the first beit din 14 years ago, is more hopeful. Last year, Sacks experienced this community firsthand. “When I arrived at the airport, probably most of the community, around 40 people were there, with Israeli flags, singing, welcoming me,” he said. He joined the community for a Passover seder in the Abramovitz house, with fish and vegetarian options, “no bread on the table” and locally-flavored charoset. “They kashered everything,” he said. He noted a community custom. An Israeli flag is displayed atop a table “every year till the last Jew from Iquitos who wishes to make aliyah is able to do so,” he said. More recently, the community has been busy again, this time for the High Holidays. In an October 3 photo of the Rosh Hashanah dinner, over 30 community members are sitting down to eat at tables, welcoming the new year 5777. There are national and international symbols — Peruvian and Israeli flags — as well as religious and cultural decorations such as cutouts of shofars and a glowing Star of David. As the Jews of Iquitos celebrated the new year, it showed that even in the isolation of the Amazon, a Jewish community can survive. Though its numbers may be diminished, inextinguishable sparks of communal life continue to be stoked on the edge of the rainforest. LEADERS of 21 Asia-Pacific nations ended their annual summit with a call to resist protectionism amid signs of increased free-trade skepticism, highlighted by the victory of Donald Trump in the United States presidential election. The Asia Pacific Economic Cooperation summit closed on Sunday with a joint pledge to work toward a sweeping new free trade agreement that would include all 21 members as a path to “sustainable, balanced and inclusive growth,” despite the political climate. “We reaffirm our commitment to keep our markets open and to fight against all forms of protectionism,” the APEC leaders said in a joint statement. Speaking to journalists at the conclusion of the summit, Peruvian President Pedro Pablo Kuczynski said the main obstacle to free trade agreements in Asia and around the world was the frustration felt by those left behind by globalization. “Protectionism in reality is a reflection of tough economic conditions,” said Kuczynski, the meeting’s host. Referring to Britain’s vote to leave the European Union and Trump’s election win in the US, he said those results highlighted the backlash against globalization in former industrial regions in America and Britain that contrasted with support for trade in more-prosperous urban areas and developing countries. “This is an important point in recent economic history because of the outcome of various elections in very important countries that have reflected an anti-trade, anti-openness feeling,” he said. Chinese officials said more countries were looking to join a China-led trading bloc after Donald Trump’s election victory had raised fears the US would scrap free trade deals. Trump campaigned for president on a promise to pull out of the 12-nation Trans-Pacific Partnership trade deal, and also threatened to impose steep tariffs against China and Mexico. China is not part of the TPP and has been pushing an alternative vision of free trade in Asia under the Regional Comprehensive Economic Partnership, which does not currently include countries in the Americas. Tan Jian, a member of China’s delegation at the summit, said more countries were now seeking to join the 16-member bloc, including Peru and Chile, and that current members wanted to reach a deal as soon as possible to counter rising protectionism. 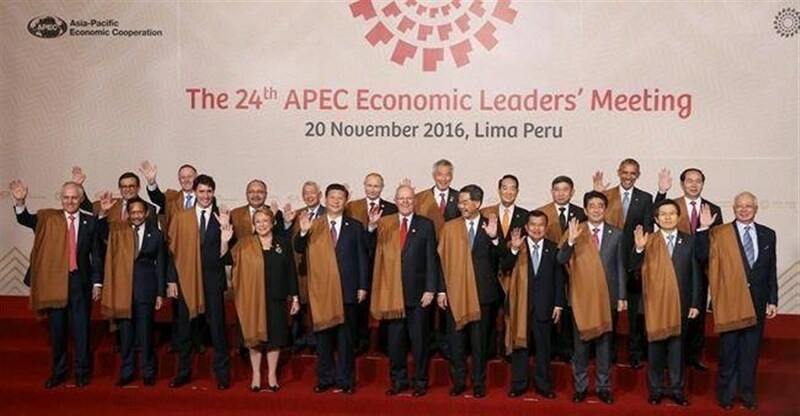 In a final declaration, APEC leaders said the TPP and RCEP were both valid paths to a broader Free Trade Area of the Asia-Pacific, which had long been a goal of the APEC bloc that accounts for 57 percent of the world economy. “We encourage that all regional undertakings, including TPP and RCEP, remain open, transparent and inclusive and draw on each other,” they said. The APEC statement also said the members would adhere to the carbon reduction goals set in Paris last year to address climate change, a problem that they called a threat to food production and food security. China’s Xi calls for ‘smooth transition’ in relationship with U.S.
Chinese President Xi Jinping on Saturday called for a “smooth transition” in Beijing’s relationship with Washington and praised outgoing President Barack Obama for strengthening ties between the two nations. During a meeting in Peru, Obama repeated the U.S. urging that all sides in the dispute over the South China Sea reduce tensions and resolve their disputes peacefully. The meeting is expected to be the last between the two leaders before President-elect Donald Trump enters the White House. Trump has been sharply critical of China. “We meet at a hinge moment in the China-U.S. relationship,” Xi said at the start of the meeting, through an interpreter. “I hope the two sides will work together to focus on cooperation, manage our differences and make sure there is a smooth transition in the relationship and that it will continue to grow going forward,” he said. Trump, a Republican, has accused China of being a currency manipulator and promised to slap big tariffs on imported Chinese goods. He has also called climate change a “hoax” designed to help Beijing. “The concept of global warming was created by and for the Chinese in order to make U.S. manufacturing non-competitive,” Trump wrote in a tweet in 2012. Obama and Xi pushed for the international community to back an agreement forged in Paris to combat global warming. Obama called that an example of the benefits of the two countries working together. “Now we face the work of making sure our economies transition to become more sustainable,” he said. Trump’s election has raised questions about whether the United States would try to pull out of the accord, a key legacy accomplishment for Obama, a Democrat. China also helped negotiate the Iran nuclear agreement, another big piece of Obama’s foreign policy that Trump has threatened to dismantle. Neither Xi nor Obama mentioned Trump in their remarks in front of reporters. “Mr. President, I would like to commend you for the active efforts you’ve made to grow this relationship,” Xi said to Obama. Obama noted that the two leaders would discuss areas of disagreement, including “the creation of a more level playing field for our businesses to compete, innovation policies, excess capacity and human rights,” he said. “I continue to believe that a constructive U.S.-China relationship benefits our two people’s and benefits the entire globe,” he said.